Kits:Look for specially marked "last kit available" deals. Demos: We will have the classroom area set up so you can see some products in action! Kind of a "try before you buy". We will demo the Stripology Rulers, Sewline Styla Pen, Chaco liner, Stash n' Store, Gypsy Sit Up-on, Cutting Gizmo, Fabric Glue Pen, 1/4" seam ruler/marker. We are even serving snacks! 1. 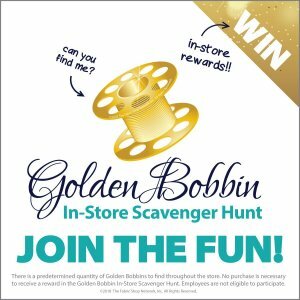 12 Gold bobbins will be hidden around the store. They will all be hidden before we open on 1/26/19. 2. Each bobbin is numbered and corresponds to a numbered prize envelope. 3. I will schedule clues to be released on Facebook each hour, 10am-3pm on Sat, 1/26/19. Since they are pre-arranged, the bobbin may be found BEFORE clue is released. 4. You may only WIN once! You must redeem your prize on Saturday, 1/26/19. 5. Prizes are non-transferable, have no actual monetary value, and cannot be redeemed for cash. 6. No purchase necessary to play. 7. Prizes: 10%, 15%, or 20% off your purchase, $5 or $10 off purchase. Again, bobbins are numbered and will correspond to a prize envelope- you win whichever prize is in the envelope. Watch for our LIVE facebook on FRIDAY! We will explain all the happenings again there! Pillows shown are for examples only...you will choose your own pillow fabric, panel, etc. 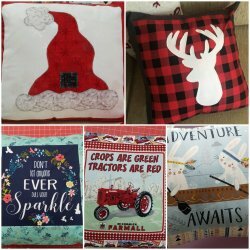 You will make an 18" decorative pillow with an envelope back using fabrics and style you choose. This is a TWO day class! 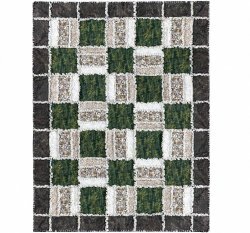 We will be using pattern as in picture but using your choices of fabric. Fabric list will be available at shop. 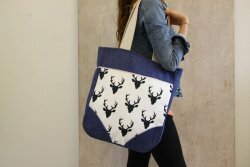 We are using pattern for the tote pictured, but you will select your own fabrics. Class participants get a 10% discount on supplies purchased for our classes! Cost: $10 (one time fee) + you must have or purchase the BOOK! beginning February 12, 2019 & ending in October 2019. This is filling up FAST...so if you want in, get registered! At our meeting: I will demo a different quilt block pattern from the book. We will SAMPLE a cocktail form the book & have snacks. Club members will get discounts on the featured pre-cut that month. You can bring show and tell that you've made from the book! This is primarily a learning & social type club! Bring your book and rulers if you'd like. We will not be sewing. It's not a class!